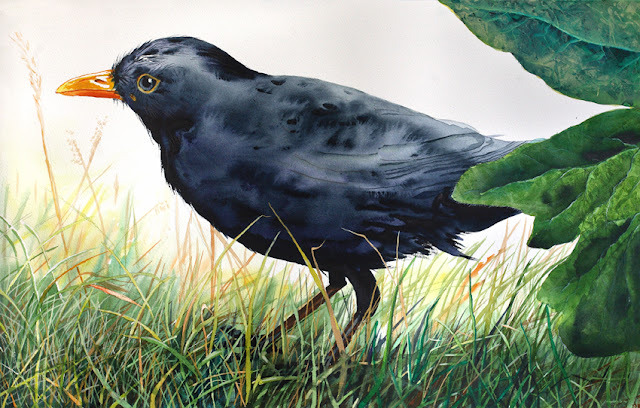 Today the blackbird painting is finished. I had been thinking of painting a diffuse background or just a suggestion of something in the distance but then I thought it was better without. As it is now the white background enhances the contrast as you see the bird against the light. I paid a lot of attention to the leaves in the foreground as they are nearest and I wanted to give you the feeling they are almost touching your nose. To achieve this it was necessary to draw them from life since they were out of focus in my reference photograph. I painted yellow as a base colour over the whole shape and when that was dry concentrated sap green was added. While the green was still wet I covered it with wrinkled cling film and left it to dry completely. When the cling film was removed there was a very leafy structure all over the shapes which looked great as it was but still needed suggestions of light and shadow. The uppermost leaf is seen from below so it has a slightly different texture and colour. 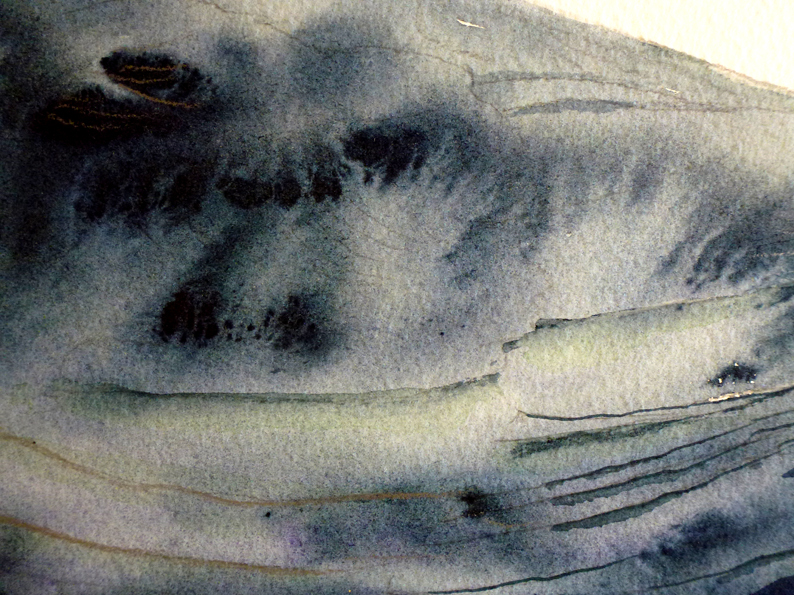 Here I added a layer of Pthalo blue and, after drying time, yet another layer of light opaque yellow. Again cling film was used while the yellow was wet. I then added deep shadows with a mixture of Paynes grey and Pthalo blue and finally created the light lines of the veins by scrubbing with a tiny hog hair brush. The blackbird itself was painted with concentrated Paynes grey and I dropped water onto the surface while the colour was still wet. This creates a cauliflower effect which can be difficult to control, but it helps to hold your breath! I used masking fluid for the straws of grass and painted the shadows between them first. After the fluid was removed I added different shades of green, taking care to render the light with thinner layers where the blades of grass turn upwards. Finally the darker shadow under the bird was added with a thin wash of Paynes grey applied with a wide hake brush.